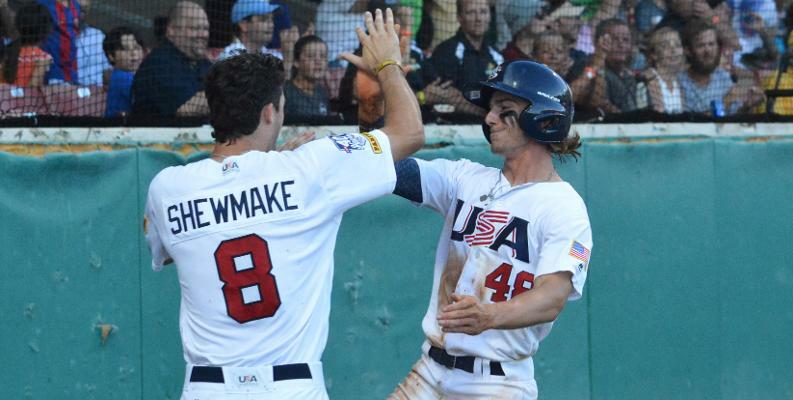 SAVANNAH, Ga. - Another strong effort on the mound and a pair of LSU Tigers at the plate led the USA Baseball Collegiate National Team to a 3-1 victory in game three of its series against Japan in front of a sell-out crowd of 4,211 at historic Grayson Stadium on Friday night. The victory gives the U.S. a 2-1 lead in the 42nd USA vs. Japan Collegiate All-Star Series. The red, white, and blue will go for its 24th series win on Saturday when the two squads square off at 6:05 p.m. ET at Riley Park in Charleston, S.C. The series finale is set for 5 p.m. ET at Luther Williams Field in Macon, Ga., on Sunday. On the mound, three pitchers combined to limit Japan to just four hits and collect 14 punchouts. Starter Mason Feole (UConn) went four scoreless frames and fanned five before Jake Agnos (ECU) took over and fired 3.1 innings with just one run allowed and six strikeouts. Max Meyer (Minnesota) went the final 1.2 to pick up his team-leading fourth save of the summer, striking out three of his own in the process. At the plate, Zach Watson (LSU) set the tone from the leadoff position, going 3-for-4 with a pair of runs scored while his fellow Tiger teammate Daniel Cabrera (LSU) was 2-for-3 with a run and a walk out of the cleanup spot. Adley Rutschman (Oregon State) and Spencer Torkelson (Arizona State) also had singles in Friday's contest as Team USA picked up a series-high seven hits, including one in every inning except the seventh. Six of those hits also came to leadoff a frame. The U.S. took advantage of several uncharacteristic unforced errors by Japan to score its first two runs on Friday. Cabrera led off the third with a base hit to right-center before moving up to second when Andrew Vaughn (California) was hit by a pitch. Just a few pitches later, both runners were set in motion and the Japan catcher's throw sailed into left to allow Cabrera to cross the plate with the game's first run. Just one frame later, Watson reached on a one-out single through the right side. Japan pitcher Hiromi Ito tried to pick him off but his throw bounced past the first baseman and down the right-field line. Running aggressively, Watson raced around second forcing Japan to try to throw him out at third, but that throw also got away and Watson scored easily to put the U.S. up 2-0. Japan got one of the runs back in the fifth but that would be as close as it would get as Agnos and Meyer yielded just two baserunners over the game's final three innings. Team USA tacked on an insurance run in the eighth to account for the 3-1 final score. Once again it was Watson getting the ball rolling with an infield single. A sac bunt by Dominic Fletcher (Arkansas) and a groundout by Rutschman advanced him to third before a wild pitch brought him the final 90 feet. "I think it tells you we have some really outstanding pitching. That's how we have won these two games with just dominating pitching. We are spoiled. We take out one outstanding pitcher from one school and bring in another outstanding pitcher from another school. What a luxury to have. We have pitched great and played great defense. I told the guys that we are just a couple of clutch hits away from having a really good team. We left some opportunities out there that, if we had taken advantage of, we could win these games running away. But every game has been a nail-biter and has come down to late-inning relief pitching." "Watson is a really good player and a really good athlete but he wasn't ready for pro ball this summer and I think he knows that. He needed to work on some things, specifically hitting the ball up the middle, hitting the ball the other way, and hitting breaking balls better. Look at his hits today, he had a hit to right-center, a hit to right field, and a hit up the middle. Even the ball he hit back to the pitcher with two strikes wasn't bad. You can see the improvement he is making. He is becoming more of a complete hitter. He is already an outstanding outfielder, an outstanding baserunner with great speed, and when he hits them he hits them good. He's got some power and wiry strength, but he just had some things he needed to work on this summer to take into next year. If he does, and it looks like he is going to, I think he is going to be an extremely high draft choice." "I had heard a lot about Savannah, the Bananas, and the crowds that they get so we were looking forward to coming here. It is such a great experience being here. The people were fantastic rooting us on and they seem like they just have an awful lot of fun in the stands here. It reminded me a little bit of some of the SEC parks that we played in. It was a little bit of an older park then we played at in Cary, Charlotte, and Durham, which was good for the players to see. It kind of brought them back to their roots when they learned to play baseball. The fans were terrific and it was just a whole lot of fun tonight." "I was really just sticking on what I've been doing, trying to go the other way and seeing that outside pitch get deep. I've been pulling off the ball all season so I've really been working on going to the opposite field and it worked out tonight. I was seeing the ball really well and, like Coach (Manieri) says, good things happen when you go the other way." "It's huge. Japan is a great team. They have great pitching and good hitting. Their pitching is outstanding and is stuff we haven't seen before. To go out there and have a good day is tough so we're happy to come out with a win today.